Installing an outside porch light is not a difficult home improvement project. It takes about an hour to gather the necessary tools and install the light fixture. 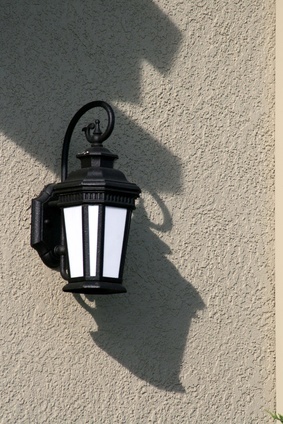 Porch light fixtures add beauty and added security to your home. Determine if the location will require a fixture rated for wet locations. If the fixture has direct exposure to the rain, it will need a wet location rating. Turn off the power to the light fixture circuit at the breaker box. If you are unsure as to which circuit operates the light fixture, turn off the main or all the circuit breakers. Set up a ladder, and remove the old light fixture. Use a Phillips head or slotted screwdriver to remove the mounting screws on the fixture. Some light fixtures will have a decorative nut that attaches it to a mounting bracket fastened to the electrical box. Use a pair of pliers to remove this nut if applicable. Disconnect the wire nuts from each wire going to the fixture. Discard the old light fixture. Use a voltage meter to test all the wires in the box to ensure that they are indeed off. Typical light fixture electrical boxes will have three wires, a black "common," white "neutral" and a green or bare copper wire that is the ground wire. Touch the meter's probes simultaneously to the white and black wires, to the black and ground wires and finally to the white and ground wires to verify they are off. Unpack your new light fixture. Mount the new light fixture following the manufacturer's recommended instructions. If no instructions are present, continue to the next step. Determine the mounting method for your light. Light fixtures may have two holes located on the base plate where screws insert that mount it directly to the electrical box. Other types of fixtures may have an adjustable mounting bracket that mounts to the electrical box. In most cases the light fixture mounts to the bracket by either two screws or a single decorative nut. Install the mounting bracket to the electrical box, if applicable, using a screwdriver. The fixture should have a hardware packet included that contains the required screws. Connect the wires from the light fixture to the wires in the electrical box. Connect black to black, white to white and ground to green or bare copper using wire nuts. If the ends of the light fixture wires were not pre-stripped from the factory, strip the insulation for each wire about 1/2 inch from the ends using electrical linesman pliers or a razor knife. Use the included mounting screws or decorative nut, and mount the fixture to the mounting bracket if applicable. If the light does not require a mounting bracket, mount it directly to the electrical box. Insert a recommended size light bulb, and turn on the circuit breaker. Test the light to ensure proper operation. For fixtures exposed to rain, add a bead of caulk around the mounting base as an added measure. Purchase a new fixture with a mounting base as big or bigger to cover wall imperfections.